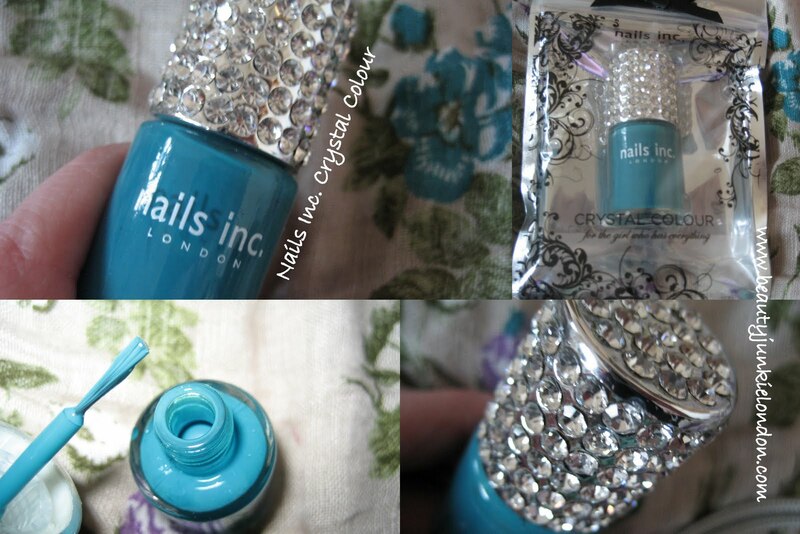 How bling-tastic is this crystal encrusted nail colour from Nails Inc.? This is the shade Eden Grove, a pretty turquoise-green shade (that I would guess is quite similar to O.P.I.’s Jade is the New Black, but I don’t own it to compare) these pictures don’t quite do the shade justice, in real life it’s slightly less blue-toned, more green. I haven’t actually painted my nails with this yet, but the magpie in me was so taken by the sparkle that I had to share it with you straight away. As the packaging says…. for the girl who has everything. Anyway, back to staring at the sparkly goodness…. ooh, sparkles….. This piece of sparkly goodness was sent to me. Reviews/opinions are honest, although I haven’t really shared any here so it doesn’t count – but you get what I mean. love the bling! and the colour is gorgeous. however, i saw jade is the new black on someone else’s blog and it looks more forest-green than turquoise-green. not a very appealing colour imo. eden grove is prettier. Haha…i’m a big old packaging magpie as well!! When I saw the picture I immediately started making cooing (or should that be squawking?) noises! I think that looks more like OPI’s Suzi Says Feng Shui, which is a turquoisey-blue. Jade is the new Black is a true green colour. Both are beautiful! Oh wow… this would be lovely to buy as an indulgent treat or a special gift! I likee! It’s a really pretty colour, but the pics don’t entirely reflect the shade in real life though. It;s really hard to get the colour in a picture. Do love the sparkle though, it would be a fun present for someone who loves a bit of bling! I’m am not a nail girl at all, harldy ever wear it but that color is pretty enough to get me to wear it. Nice blog by the way. I’m from New York and have my own beauty blog. Come say hello at emanticoff.blogspot.com. Chau for now chica.